When it comes to plumbing problems, there are times when nothing can truly be more important than your kitchen functionality and essential appliances. From basic running water and dishwashing to grinding up food and readily available ice cubes, kitchen plumbing is basically the hub of the home and must be kept fully operational. Moreover, when it comes to planning a kitchen remodeling project, the main focus is the functionality of the kitchen. Your family uses the kitchen everyday, so when you want to plan a kitchen remodel, you should start by understanding the wants and needs of your family first. At Pittsburgh's Kwiatkowski Plumbing Services, we will help you do just that. We can help you answer the big questions, such as how much more space you need or whether you have the right appliances for your lifestyle or the overall design of the kitchen. During this phase, you will understand what you need and the estimated cost. After you have determined your budget, a kitchen remodeling expert will help you design a new kitchen plan. Together you will decide how to execute this new kitchen, from the color of the tiles above the counter to working around the plumbing and electrical systems. This is where it becomes clear that a kitchen remodel is a big job and you will be thankful that you chose to hire a professional to build your family a new kitchen. Of course, a kitchen remodeling project is not always necessary - or in the budget - for some families. Our certified team of experts can still help with kitchen plumbing repairs you need to get your kitchen functioning. We specialize in several common kitchen plumbing problems, even those that may not be such a simple fix. The kitchen sink can experience a few problems, such as a leaky faucet, a clogged sink drain, or a drop in water pressure. A leaky faucet is more than an annoyance because it can inflate your water bill if you let it go. Try tightening the faucet head, else you may find that you need to replace the faulty faucet. However, a leak at the base of the faucet is a more serious problem and a professional plumber is the best option. 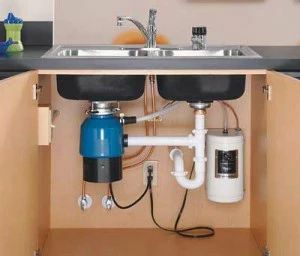 More than the faucet, the sink also includes a garbage disposal. Typically, issues or bad smells are caused by a clogged disposal. There are many things, even food items, which should not be put down the sink. Overall, kitchen repair can be a multifaceted project. You need not worry about your clean floor getting dirty, as all Kwiatkowski Plumbing experts respect and protect your living area by wearing shoe covers and using drop cloths. Dedicated to repairing your kitchen, bathroom, shower, and other minor to major plumbing issues, call us today at (412) 221-5404, so, we can make your kitchen the center of attention once again.